The Sun appeared, and all the shadows ran. Light ran after me and hunted me down. Today is Mevlana Jelaluddin Rumi's birthday -- September 30, 1207. Poets, seekers, and sages, let's celebrate! Come on, let's spin and dance, like the madmen and wild women we are! 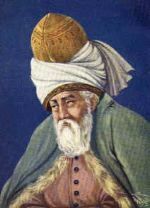 Many of Rumi's poems make reference to the sun. This always has layered meaning for Rumi since he was deeply devoted to his spiritual teacher Shams of Tabriz... The name Shams means "the sun." The sun for Rumi can be God or the radiance of God shining through his beloved teacher or the light of enlightenment. Though why should we separate them out? They are all the same Divine continuum. The light of God comes, the clarity of enlightenment shines, and the shadows disappear. Filled with that light, surrounded by the light, all of existence interpermeated by that light, we can search for some root or tendril of those things that once seemed so immutable and defining, but the more we search, the more we recognize how gossamer thin the very fabric of our own identity actually is. Then it hits us: We are not really "selves," we are not the distinct nuggets of identity commonly imagined, we are not even illumined beings surrounded and permeated by light. There is only light, and no "I" in the midst of it. The only "self" we can claim is not really a separate being but, rather, a distinct point-of-view within that one immense shining Being. The enlightened mystic sees only that light, dancing and playing, sometimes eddying into "me" and "you" and all the world, without actually losing its luminescent nature or flow. So, seekers, while you are on your spiritual hunt, remember to look over your shoulder. That glow you glimpse might just be hunting you.